President Barack Obama has signed off on federal grant money totaling nearly $1.1 billion that will go toward improving portions of the CTA Red Line on the North Side. The money will be used to reconstruct the Lawrence, Argyle, Berwyn and Bryn Mawr stations as well as overhaul about a mile of nearby track and support structure, Chicago Transit Authority spokesman Brian Steele confirmed Sunday. The grant will be officially announced Monday. The stations, each built in the 1920s, will also each receive something they notably lacked: an elevator. 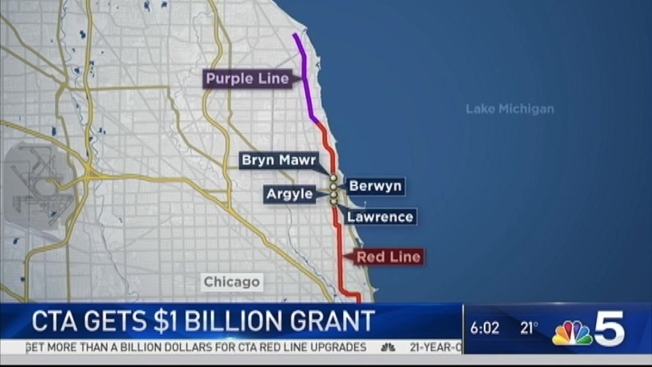 The money will also be spent to create a “flyover” for northbound Brown Line tracks where they intersect with Red and Purple Line tracks just north of Belmont Avenue. “It will eliminate one of the biggest bottlenecks in the entire CTA system and allow us to run more trains and alleviate overcrowding not only now but in the future,” Steele said. Red Line usage, which accounts for 30 percent of total ridership among the CTA’s eight train lines, is on the rise. “The Red Line is the backbone of the system,” Steele said. Construction is tentatively slated to begin in late 2018 and will take four or five years to complete, he said. Planning and engineering will begin this year. The federal money will be matched by several sources of local funding that will include CTA bonds and a newly created TIF fund that will collect money from property owners who live within a half mile of the Red Line between North Avenue and Devon. The City Council unanimously authorized a transit tax-increment financing district in a special session Nov. 30 in hopes of nailing down the federal grants before Obama leaves office Jan. 20. Crain’s Chicago Business first reported the grants had been approved.